Find it with Splunk. Fix it with Resolve. Avoid alert fatigue and accelerate incident resolution by combining two powerful technologies. Operations teams can improve efficiency and service delivery by adding Resolve to their Splunk installation. With Resolve, Splunk Enterprise and ITSI users can validate events automatically and resolve incidents faster than ever. This is made possible by Resolve’s end-to-end and HumanGuided automation. 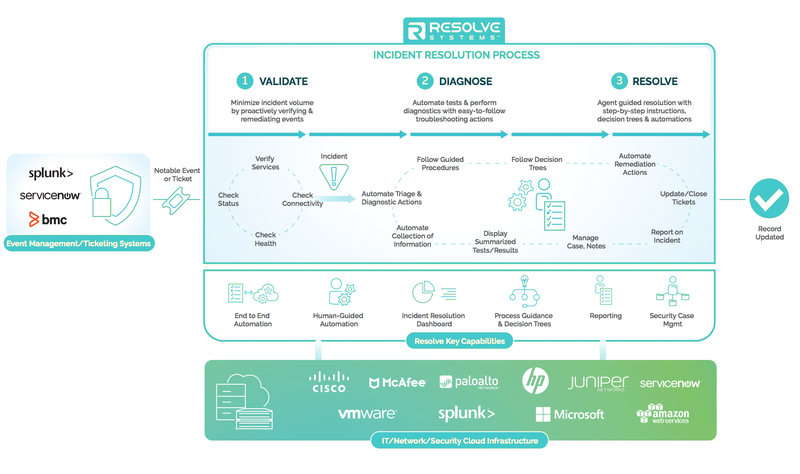 Resolve tackles event validation, incident diagnosis, and resolution automatically whenever possible. When operators need to get involved, Resolve provides automated diagnostics, along with user-friendly results, step-by-step procedures, and interactive automations to accelerate every incident and minimize escalation. Protect the team’s productivity by eliminating false and transient alarms through automated validation. When you can’t fully automate resolution, empower agents with a view of automated diagnostics. Give agents troubleshooting instructions with embedded automations to help resolve incidents without direct access to critical systems.